Perhaps it’s merely an emotional Doppler effect from handling the first seed catalogue in yesterday’s mail, or maybe there really is so much angst-laden waiting projected from this wintry backyard scene. Waiting for enough sun to eat al fresco dinners on the sheltered patio. Waiting for new shoots on the bare little shrub that reminds me of the pirated forsythia branches waiting to root in my milk glass vase - the one my sister secretly covets that features vertically aligned white bumps. Waiting for new, soft, pale tips to peek shyly from the ends of the pine branches. Waiting for a fresh coat of fence stain to counteract monts of weathering winter. Waiting for the snow to fully melt and not blow back in overnight. 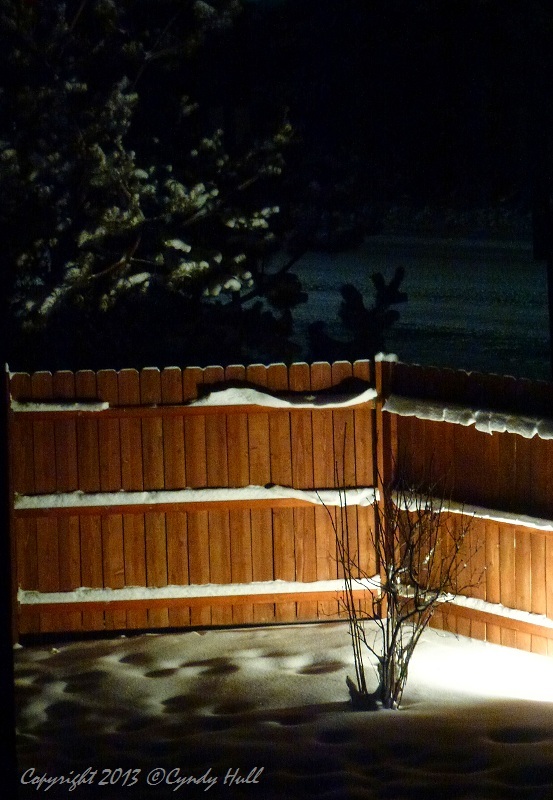 Interestingly, my initial view of this night-time courtyard produced feelings of cozy peace. Timing is everything, so they say. I don’t care what paranoid thoughts the groundhog had about his shadow - it’s high time for some early signs of spring.